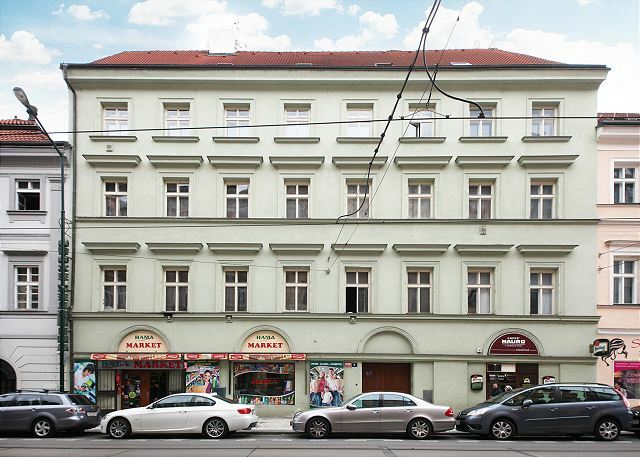 Masaryk is a spacious apartment, which has a remarkable ratio between its price and the overall capacity. You can rent this apartment for up to 7 people, although it belongs to the price range of much smaller apartments with a lower capacity. 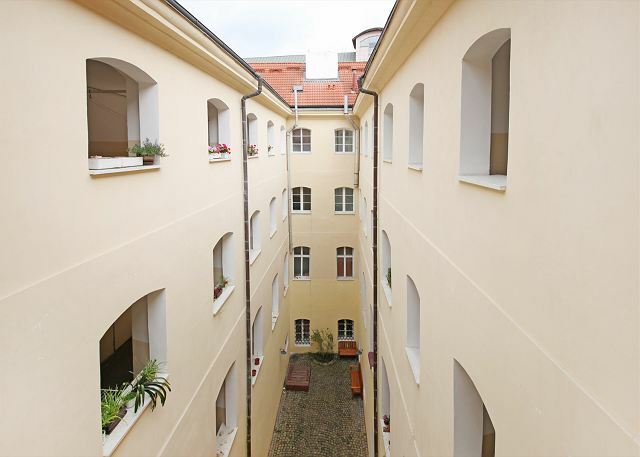 This apartment is well located in the very center of Prague. 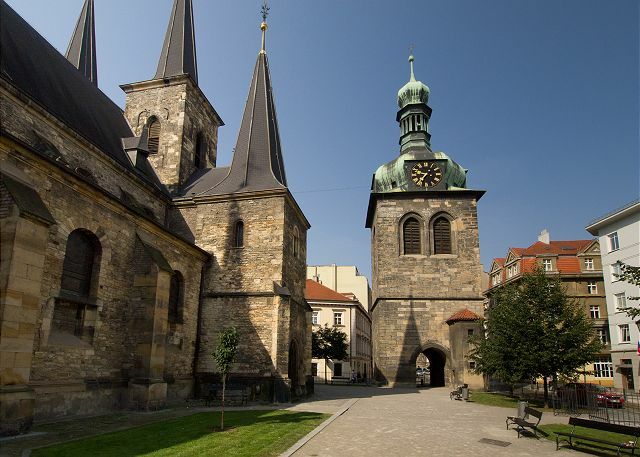 It only takes a few minutes to walk to all the major sights in Prague, such as the Old Town Square and the Wenceslas Square. 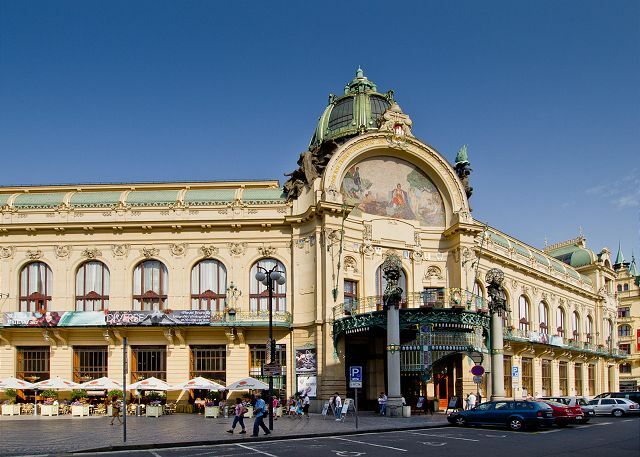 There is also a tram stop "Masaryk Station" and the Republic Square metro station nearby, therefore it is very close to public transport. If you like to go out at night, be sure to drop by Long Street, which is famous for its bars and nightlife. 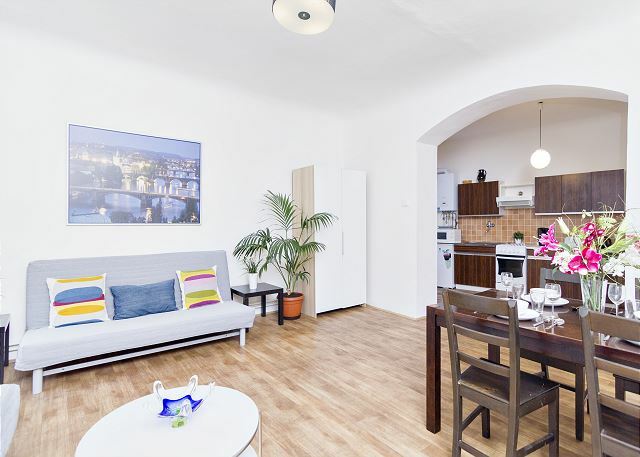 The Masaryk apartment allows you to unwind after a long day of sightseeing. 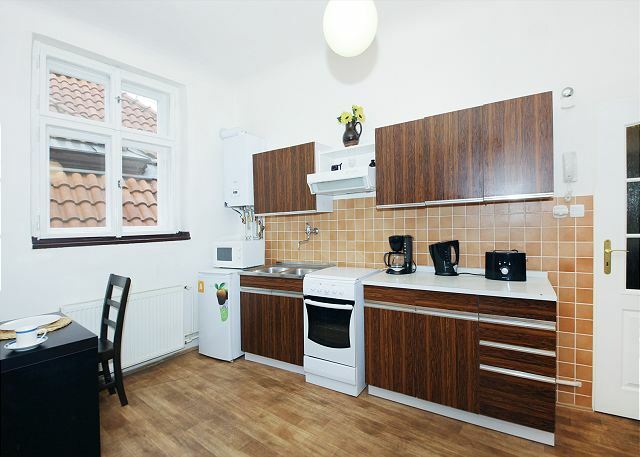 You will be able to use the well-equipped kitchen (coffee maker, microwave oven, toaster, etc.) to prepare a delicious dinner. If you rather go out for meals, you can enjoy the various fine restaurants and bars all within ten minutes! 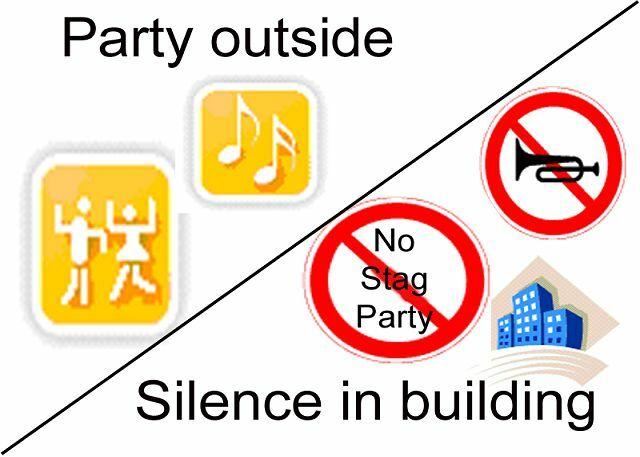 In case you are sensitive to noise, we will advise you to choose any of our other apartments in this neighborhood such as Smetana and Klimt, because HavlÃ­ckova Street is rather busy. 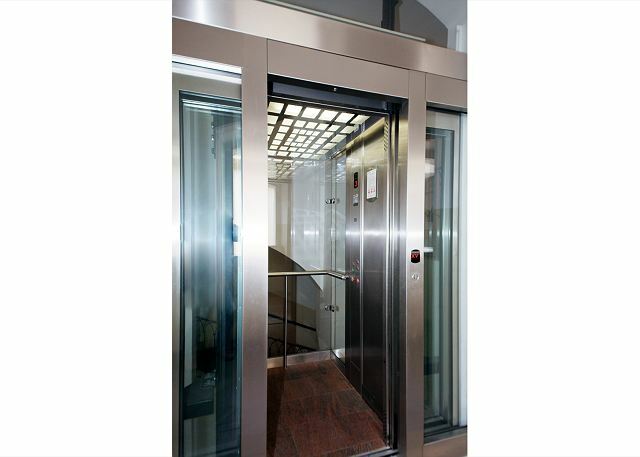 According to excellent ratings, the windows give sufficient protection against noise. 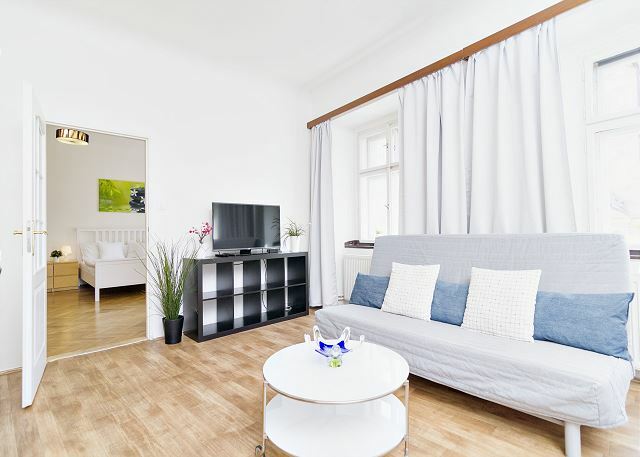 The apartment can accommodate up to 7 people and is therefore an ideal option for families or groups of friends who want to explore Prague together. As all our other apartments, there is a high speed internet connection. 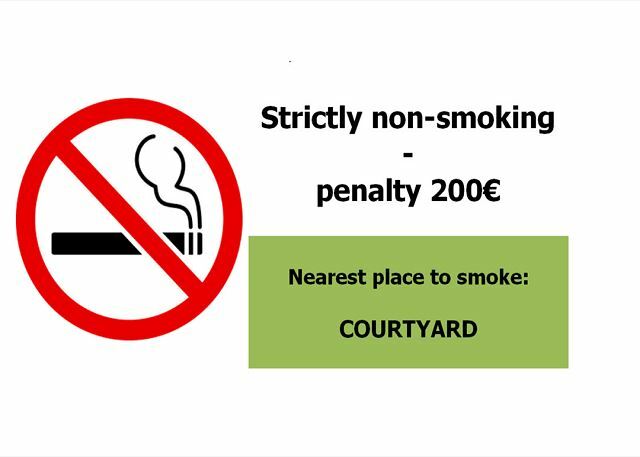 Also the apartment is non-smoking with the option of smoking on the floors. 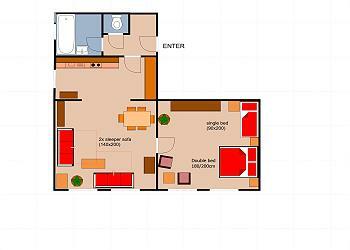 If you want a better idea of what the apartment looks like, scroll down to view the floor plan. We felt like living in prague! Everything is close! We can walk to sightseeing spots,shops,restaurant,opera and concert hall. We enjoyed short trips from near station. Thanks to the comfortable and clean room we had a wonderful time! Reception and return of apartment key was very easy. Nous avons apprécié cette location, à deux pas du vieux Prague. Endroit agréable et calme. Nous recommandons. 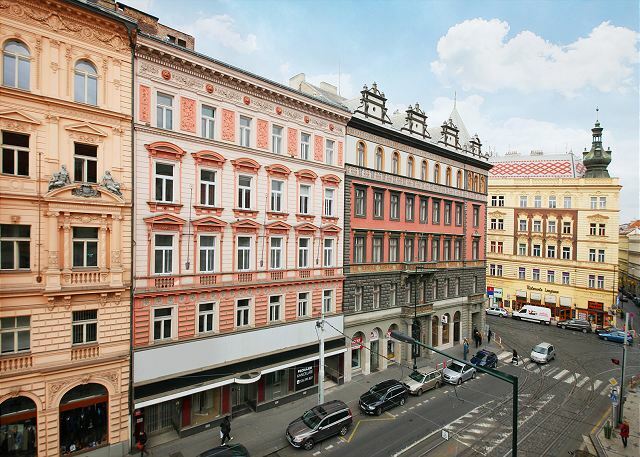 Great location in the heart of Prague! Perfect location, clean apartment. All questions were answered promptly. très bonne expérience, excellente localisation, appartement très commode et confortable, très bien équipé. Seul point noir: le bruit du tram qui fait trembler la maison et fait penser à l'orage! It's good honestly to recommended..
IKEA apartment in a central location. 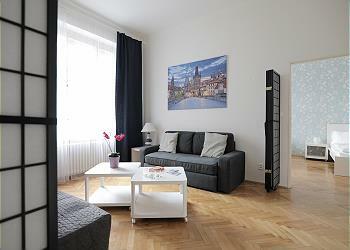 The apartment was warm and clean and in a central location, close to all the main tourist attractions. It was furnished throughout with IKEA products; beds, tables, lamps, cutlery, crockery, etc, and some of it had seen better days. The whole place looked a little tired and could do with some maintenance. The iron is in a dangerous condition with a cord which is worn through in at least 2 places - we chose not to use it! The door to the apartment does not feel secure; when it is closed, there is a lot of movement. Further to this, there is no safe provided for passports, money, etc. we are a family of 4 persons 2 adults and 2 kids 2 and 7 years old. 1.Location! Location! Location! 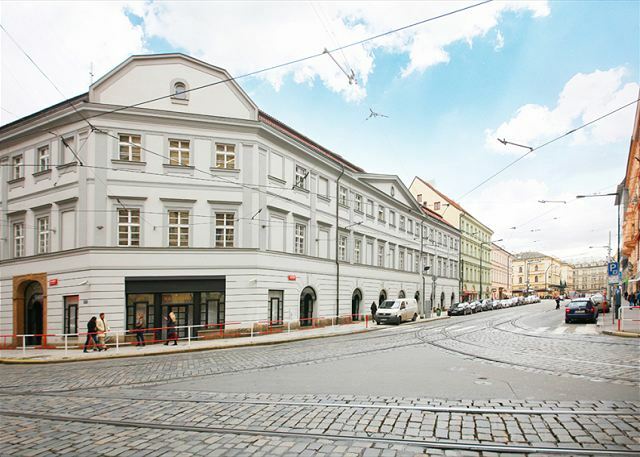 the apartment is greatly situated near the republic square close to the old city shopping streets and centers and the old city. 2. Public transportation. Very close to tram metro and bus stations. Many lines that will take you almost everywhere in the city. 3. Close to shopping center the Palladium and Bile labut centers are 2 minutes of walking. 6. TV can be connected to the internet so practically you can watch everything by net. 7. Very efficient customer service - we had 2 issues we needed help they answered promptly and problems were immediately fixed. 1. Furniture is very basic - in the dormitory there were 2 single beds put together and not a double bad which was not very comfortable. 3. Regulation of water temperature in the bath is difficult it takes time till you get water that is not to warm or to cold. 4. There was a significant wetness in the walls and ceilings in the bath and the dormitory. Everything was great, nice spacious room, pretty surprised with the room size and we have large windows, so the room is very bright. 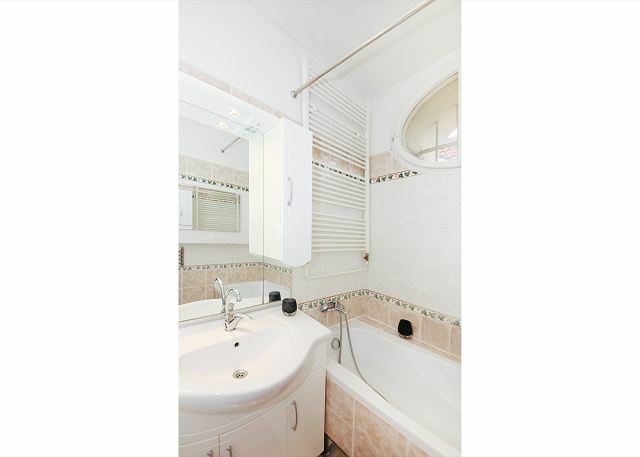 Perfect location just a couple of minutes walk to Old Square, supermarket are nearby. The highlight of this place is they provide us a portable wi-fi hub so you could carry a portable internet when you are out ,not something I'd seen anywhere before. Very cool! The other things is the apartment is not realy clean. L'équipe rentego a réagi immédiatement suite à un problème et l'a solutionné, et le service de chauffeur est pratique. Je recommande à tous cet appartement . Rentego made our whole trip enjoyable. Very helpful and responded to emails quickly and 24/7. 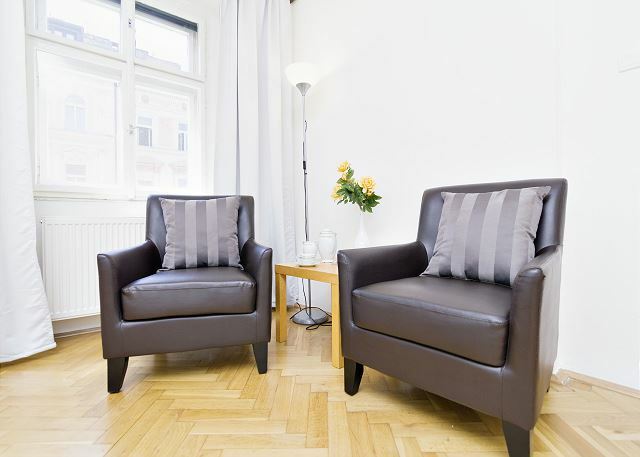 The location was fantastic and the apartment was extremely spacious and clean. I recommend arranging tours and transfers through them also. Great deals and hassle free. The Masaryk apartment is very spacious-tall ceilings and lots of space in the rooms and is in a great location but I would not suggest it for warm days as it doesn't have air conditioning and the streets outside are so busy (night and day) and polluted that it's not comfortable to have an open window. I would suggest it rather for younger crowd than a mature couple or a family. The equipment is very basic, but generally there's all you might need, it's great to have kitchen when you travel.Beds and bedding could be more comfortable, two single covers on a double bed was a little surprise too. Generally the apartment feels little bit empty with an odor of an old building. Also the building where it's placed has a little bit dark feel to it but I can imagine that is something that some people would appreciate- taste of old classic Prague rather than a fancy hotel. I think it's perfect for a group of younger friends who want to be close to downtown and don't mind the noise. IT was A clean apartment. God location in The old city center. We where 6 people and IT was Ok. We just sleep there. One big bedroom. Thanks a lot Svein, it's great to hear that you enjoyed your stay in the apartment MASARYK :) Don't hesitate to contact us next time you come to Prague! Appartement très bien localisé, très grand et lumineux. Nous avons apprécié la qualité des services aussi bien à la réservation qu'avec le chauffeur pour les transferts. Service très confortable.Tout est fait pour faciliter notre séjour (de la préparation au séjour lui-même). Ce qui est confortable c'est d'avoir à disposition dans l'appartement des produits d'entretien et le basique pour la cuisine (sel, sucre, café, thé...). Je recommanderai cet appartement et les services offerts par rentego qui sont excellents. Merci . Thanks a lot :) See you next time! Vive le centre de Prague !!! Idéalement placé en plein centre de Prague l'appartement est tres agréable comme annoncé par les photos avec un équipement satisfaisant. Le Tram passe en bas de la rue , nous avons apprécié cette ambiance mais prévoir des boules quies pour les oreilles sensibles des 5 h du matin ou le tram reprend du service . En juillet comme nous y étions, si on peut gérer son temps pour le parcmetre( tous les 4 h plage de 8H à 18 H) la bonne surprise c'est qu'il y a toujours des places en bas de l'immeuble et le coût est alors bien moins élevé que dans un parking payant. we were very pleased with the overall location service provided by RenteGo. No doubt we'll recommend this to any friend or relation. The flat is very close to the old center, to a mall, a train station... It's very easy to visit on foot. The apartment is large with plenty of storage, we slept very well, we had great holidays ! Merci beaucoup Soazig. À la prochaine! This apartment is very well located. 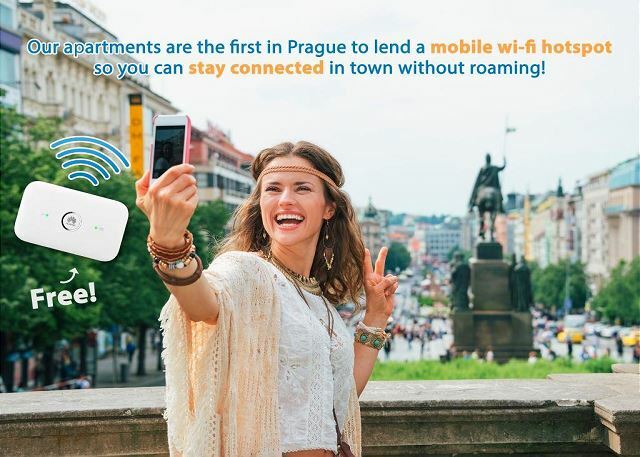 It has everything needed for great moments in Praga. Thank you so much for rentego group. We Will see you again in the future. The location of this appartment is perfect. The property was little bit old but still ok. The only negative thing was that the shower didn't work. Thank you, Jutta. We have already informed our technician about the shower and he will take care of it, thank you for notifying us. Appartement très bien situé a deux pas du cœur de la ville.Un peu bruyant avec le trafic du tram en contre bas. Merci beaucoup, Michel! Nous vous remercions d'avoir choisi Rentego lors de votre visite à Prague et nous nous réjouissons de votre prochaine visite. 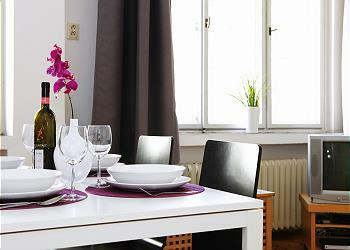 We were very satisfied with the property ; The flat was clean, the management compagny very professionnal. Thanks a lot Sophie, we would be happy to host such nice guests again! A la conquête de Prague ! l'appartement convenait tout à fait a la réalisation de notre projet : très bien situé par rapport au centre touristique, nous avons pu tout faire à pied. Il y a toutes les commodités à proximité : poste, transports, marché, supérette bio... Très pratique, très propre. Nous le recommandons. Le système RenteGo est idéal : clé envoyée et explications.. On découvre Prague dans d'excellentes conditions. Web have booked by internet ans all was good. the only problem was the water in the shower. L'appartement "Masaryk" a parfaitement répondu à nos attentes pour cinq nuitées à 3 personnes. Deux vastes pièces au 3e étage. Equipement suffisant pour repas légers. Situé à l'est de la Vieille ville, mais à 500 m seulement de la Tour Poudrière. Très bien desservi par les lignes de tram, par exemple pour monter directement à Hradcani. Revers de la médaille, leur roulement , brièvement interrompu la nuit, peut gêner un sommeil léger. Bonne adresse pour séjourner à 3-6, correspondant au descriptif. Aucun souci particulier. Nous avons apprécié le service de taxi entre l'aéroport et l'appartement. pratique et facile d'accès.Mobilier vieillot (les photos sont très flatteuses!! ), les deux sofas peu confortables. Très bien situé, plein centre. bon rapport qualité prix, à conseiller. sheets and towels, kitchen utensils. Well located with great trade around and with good public transport .Michaela welcomed us very friendly who gave us all the necessary information. Certainly recommend it to my friends, both the apartment as service RENTeGO. Perfect location, spacious apartment and easy comunication with the host. nous sommes prêts à renouveler l'expérience de location avec Rentego dans d'autres capitales européennes! It was family vacation with 2 young children. The appartment was a great choice (place close to the old center of Prague, large rooms, clean), except for the noise (trams are working even during the night). But anyway, we enjoyed a lot our stay and have discovered a beautiful town. Thanks again for your service. Dans l'ensemble nous avons été très satisfait de notre WE. Pour plus de détails voir le questionnaire de satisfaction rempli dans l'appartement. Nous serions prêt à repartir avec cette enseigne dans une autre ville si possible. 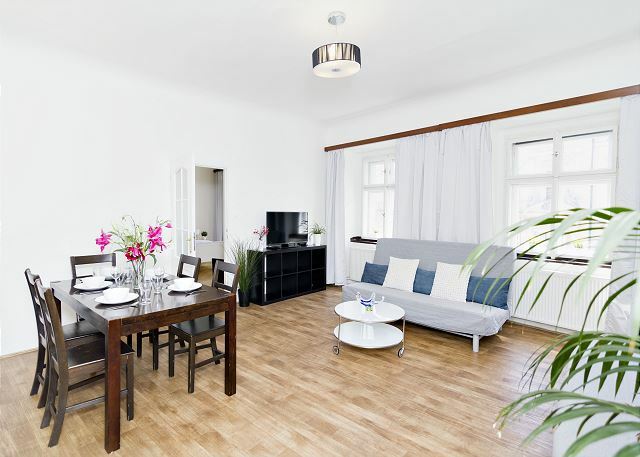 The apartment's location is great, within walking distance to all the places of interest. The Rentego staff were extremely helpful and always available to answer our doubts and solve our problems. The apartment was big, clean and very comfortable. I would totally recommend this place. I had the opportunity to visit Prague in late September and I loved the place I stayed at. It was very spacious and there was a lot of information in the apt about things to do in the area. And they had it in different languages! It was a central location not far from sites and from where I wanted to be as well as near public transportation. Location is convenient, appartment is huge. Rentego team very competent and helpfull. Appartement très confortable et bien situé, presque tout est à distance marchable. Cependant lorsque les fenêtres sont ouvertes, le tram est bruyant. Dans l'ensemble, je recommanderais cet appartement. Terribly comfortable and the living room furniture not clean or comfortable. The apartment was quiet and located close to good transportation. Bedrooms were spacious and the kitchen was well equipped and great for cooking. The flat was big, clean and good localised. Nous étions 7 et sommes restés une semaine dans l'appartement MASARYK. Il est idéalement placé, au coeur de la ville et offre tout le confort nécessaire. Je vous le recommande sans aucunes hésitations. De plus l'équipe de RENTeGO est adorable et très serviable. excellent place to live, close to the city center, perfect to leave your baggages and walk to the famous place, enjoy your visit!! It was everything that we expected. I liked how close it was to the town centre. Very spacious and could even accommodate for groups. Appartement conforme aux photos, très bien situé dans Prague à côté du centre commercial Palladium, d'une station de Tram et du Métro. Appartement spacieux, propre. Les lits sont confortables. Pour 7 personnes c'était très bien. Je le recommande à tous! Si un jour je repars à Prague en étant ce même nombre de personnes, je le reprendrai sans hésitation! Very professional Rental service( Rentego) . Thank you to Vladka for her help and congratulations for her perfect French. So helpfull to be able to speak french with her. Overall it went very well. furniture was fine, checkin and checkout went very smoothly, location was great close to old town square and 2 minutes from the big shopping mall. We had problems with wifi, the shower was always leaking, some linens were missing. informations, organization, the rented property were quality of good. But we hadn't understand why we had 4 sheets for 5 persons. La primera impresión que recibimos al ingresar al apartamento fue desagradable. El olor a humo de cigarrillos era excesivo, tuvimos que ventilar todas las habitaciones. Otra sorpresa negativa fue encontrar que en la nevera no funcionaba el freezer, pero no resulto nada grave. Lo demás, la ubicación del apartamento, el estado del mismo y del edificio, el moderno ascensor (creíamos que el acceso era por escaleras), todas las explicaciones recibidas para el check-in y el check-out y la facilidad del sistema de contratación fueron excelentes. De volver a Praga, volveríamos a contactarnos con Uds. And we loved Prague!!! The place was clean and spacious, but for 112 Eur. I was expecting something a bit less basic. Strange living room arrangement, not conducive for relaxing and the furniture was old Ikea or worse. Our last day the key pad combination was changed and we were locked out, so had to go to the nearby Hilton to ask the concierge to call the rental agency. The person we talked to seemed irritated, as if it were our fault! It could have been a disaster. However, the location is excellent and an easy walk to the metro, train station, Old Town, etc. Small gripe, but if I'm paying that much, should I have to take out my garbage when I leave? Isn't that what the cleaning service does? 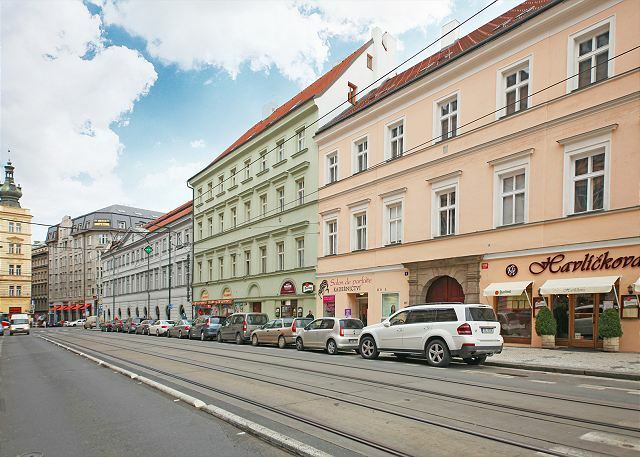 I go to Prague quite often and was looking for a place to stay for 2 to 4 people, not too expensive, in the center but not in the tourist area and I found exactly what I wanted! Huge rooms, confortable beds, convenient furnitures and perfect location. I would certainly advise to go there. I have appreciated a lot the service of Rentego. I had already gone there two years to Prague with the same agency and if I return in Prague I would go back by this agency. like this room very much! It's close to city center, and well facilitated. Eating around will not be a problem. Moreover, it's close to the main bus station, only 10 min walk or less. I'll definitely recommend this room to visitor to Prague. Large apt very close to all sights. Parking at the Mariott within 1 block. Small store on the 1st floor was convenient for drinks and small items. Looks like a new elevator is being installed. Seems that items reported as broken over the last year have not been resolved. Wash machine is not working, freezer not working. Nothing that would ruin a trip, but not as expected. I will say that the staff was very quick to respond to the issues and offer solutions. The entire process from booking to departure was very well organized. They provide great documentation on the area and the rental process itself. L'appartement est idéal pour un séjour familial, spatieux et très bien situé pour tout faire à pied. Je recommande Rentego comme système de location simple et efficace. Everything worked well, only a few cleaning issues. The washing maschinery was full of long hair. Not very charming. The freezer didn't work, and seemed to have not been working for some time. A fridge with a small internal freezer might do it, just for icecream, ice cubes and a little food. Some of the windows had issues with the handles, nothing alarming, but it might need a check-up. Apart from the technical details, everything was super. And location is perfect, not to close to the party zone. 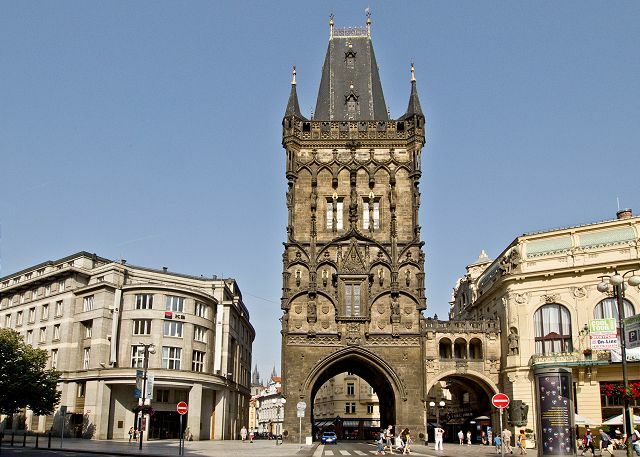 Un emplacement parfait pour découvrir Prague. Nous n'avons jamais pris les transports en communs (qui sont au bout de la rue). l'appartement est grand, spacieux, bien équipé, calme, fonctionnel. Bref, au top! We've enjoyed our stay very much - it's hard to tell details about what has been good - almost everything was perfect. One minor thing - the washing machine was broken, has to be repaired. Apart from that, everything was excellent. I will definitely recommend your company to my friends. Thank you. We had a wonderful holiday in Prague.The appartement is ideally situated and the rentego team very professional and helpful. Pour la reservation votre équipe parlant français, cela à grandement facilité les démarches. De plus vous avez toujours été très sympatique que ce soit au téléphone ou sur place ou l'acceuil a été très agréable. ?????? ?, ???? ????????? ? ???????. ??? ?????????? ?, ????? ?????????? ???. Great team, great location, recommended !!! All perfect, staff, location, city. thks !! Très satisfait. Appartement très propre et très bien placé. 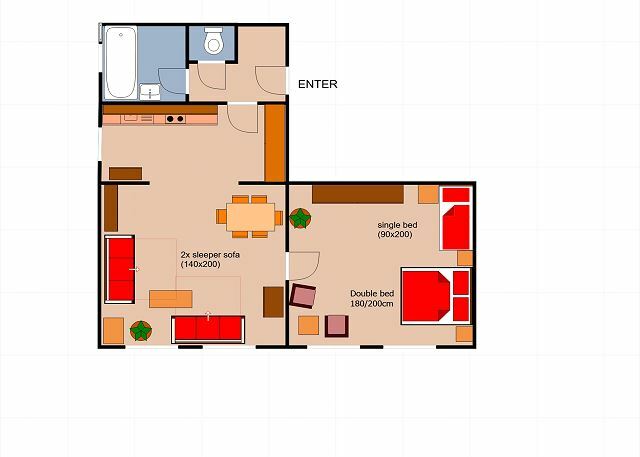 Appartement bien situé (nous avons tout visité à pied), confortable, très propre et spacieux. Grand appartement très bien situé. Près de la vieille ville et de la gare. Had a heat and hot water problem in first apartment, but agency took care of it right away and was very helpful with us moving apartments. Great service and gorgeous apartments, I have already recommended it to many friends! Very good reactivity and availability of the local contact person. 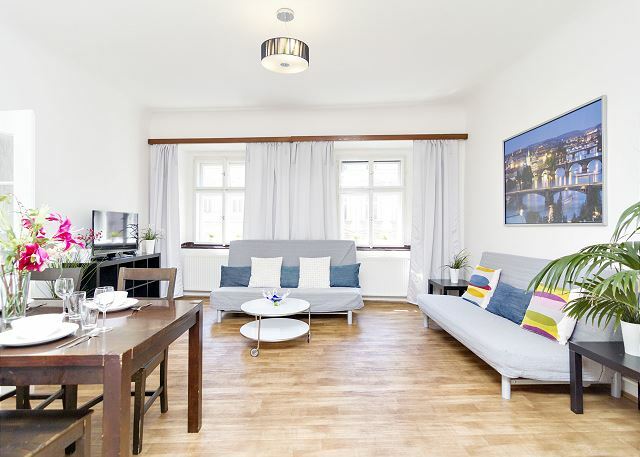 Named after the famous czech composer, this bright and spacious apartment is situated in a calm district of Prague 1 Nove Mesto, 10 min walk from Old Town Square and Charles Bridge, with a view on the Vltava river and a small park close by. 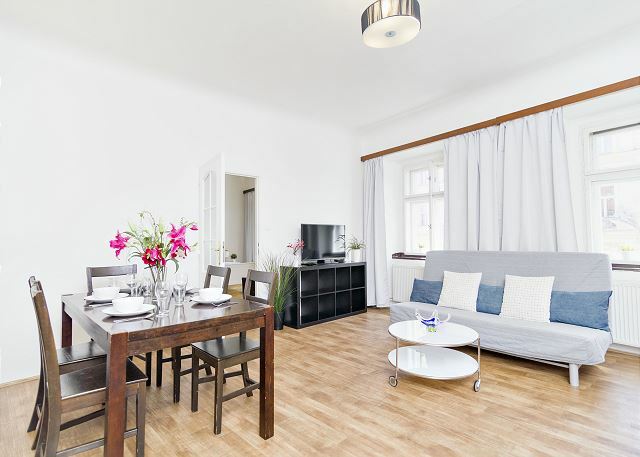 Bright apartment, close to Vltava river, in central Prague, 10 min walk from Old Town Square. 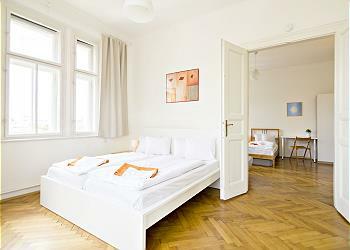 It is situated 2 min by walk from apartments KLIMT and SMETANA, which can be practical for groups. Park close by, quiet district.